Interval training is increased intensity for a given activity (lifting, running, rowing, cycling) for a measured amount of time, followed by a reduced level activity for a measured amount of time. Typically done in sets, interval training can be anaerobic – fat burning high intensity interval training (HIIT) typically focused on starving larger muscle groups of oxygen – or aerobic, where low to moderate intensity is used for a longer period of time, allowing muscles to ‘breathe’ and build stamina. Both anaerobic and aerobic exercise are beneficial and interval training is a great tool to realize those benefits, while at the same time adding a new dimension to workouts to keep them interesting. Measuring intervals is easy, but too often it distracts you from your chosen exercise. I’ve been in all-out sprints with my left arm unnaturally poised in front of me so I could read my watch (with difficulty and added risk). Others rely on a partner’s shouts to let them know when to speed up, slow down or stop. 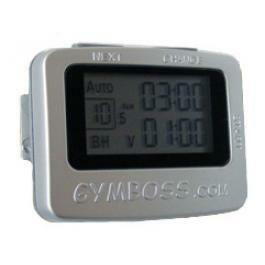 A small device called the GymBoss (1 3/4 x 2 1/4 inches) is a lightweight, inexpensive ($20USD) and eliminates the need to focus on anything else but your workout. Clip it to your belt, stick it in your pocket or place it on a shelf for indoors workouts – it’s barely noticeable until a shrill beep, strong vibration or both effectively alert you (to be honest the first time it beeped it startled the hell out of me). For $20USD you really can’t beat the GymBoss, it does everything it says it does and does it well.